I love my 3 year old (E) to bits. He is possibly the funniest person on the planet. His favourite phrases at the moment include “that sounds loike a gwreat idea mammy” (no clue who taught him that one, ahem) and “you’re a codfwish” (courtesy of Captain Hook). There are some days that I’m not his favourite person, like days when I have to clean or when the baby is niggling so much that I find it hard to dedicate some time just to him. I had a day like that yesterday. The baby was attached to me like a limpet and when I did try to put him down to get stuff done in the house he whinged, LOUDLY. I felt like the house was the middle of a laundry explosion. E was doing everything he could to get my attention. This normally involves lots of loud noises, in particular when I’m trying to get the baby off to sleep. Eventually with a large sigh mid-morning E proclaimed that he wanted to go with Aunty C to the “coffpee swhop” to eat “scones with raisins in em”. I knew I was in trouble then; we were 30 seconds from meltdown as I hoiked the baby onto 1 hip and with 1 hand I grabbed a big bowl from the press and told him that if he wanted scones he could make them himself providing he washed his hands first and did the washing up afterwards. I scraped the back of my mind for the bones of the old reliable, Darina Allen recipe from the Ballymaloe Cookery Course book. A small dustcloud filled the spot where he was a moment before and it wasn’t due to me measuring out 454g of plain flour (1lb imperial weight). He had sped up the stairs, rolling up his sleeves as he went, so I took the opportunity to lash a teaspoon of baking powder, and half a teaspoon of salt into the bowl with the flour. Then I boiled the kettle, popped the baby onto his playmat for a minute and took a cupful of raisins along with a teabag, stuck them in a bowl and covered them with the boiling water. E floated down the stairs, he was doing this cloud impression justice alright. I popped him on a chair at the table along with the bowl of dried ingredients and it bought me a good 10 mins while the baby played on his mat. Just about enough time for a hasty cuppa myself. I was mightily entertained by the running commentary coming from E about the texture of the flour (fluffy, cloudy and soft just like his pillow in case you’re interested). The mug of tea drained I measured out 410ml of buttermilk (14fl oz imperial). I then separated the raisins from the tea concoction. Yes I did remember to get rid of the teabag, as that would have been a nasty surprise in a scone otherwise! Mixing the raisins into the flour bought me another 5 mins which was enough to settle the baby off for a nap. I then came down to supervise the messy mixing stage. Oven heated to 200 degrees Celcius, E got nicely messy right up to his elbows mixing in the buttermilk. Once the dough pulled together we stopped mixing, flattened it out on a surface dusted in flour and he set to doing his next favourite thing to the “mixy mixy” which is the cutting out of shapes. He popped them onto a floured baking tray and I put them in the oven for about 15 mins until golden brown. Best served warm, or on the day they are baked they are perfect with some fresh butter and perhaps a little bit of fruit jam. 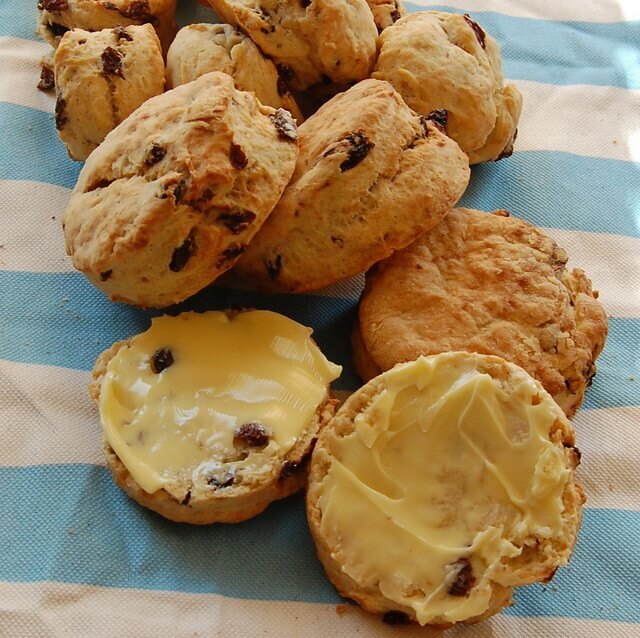 You don’t need the addition of the raisins to make these scones and they are delicious plain with a small bit of parmesan cheese grated on top before baking. They’re all gone now but E says he wants to make more tomorrow. If they buy me this much peace I think I’ll make them everyday! Sounds yum. I might make some later! I hope you got E to make some for you me dear! Do you realise how excited I just got reading this? E is only about a year old than my little man. So only 12 months to go before I can put him to work making yummy scones for me! Haha! I can imagine your wee lad would love making these Lisa. E only said to me earlier that he wanted to get mucky doing the baking! Oh thanks Lily. I’m off to make a couple more myself in a tick! You could freeze them however they aren’t as light and fluffy after defrosting that’s the only thing. They are perfectly edible though! Oh it really adds something to the scones. Do try it out! Will have to give them a go.but never have buttermilk.I will put it on the list for next week. Can you put up the recipe please Catriona. Hi Paula. I think you’re sorted now!